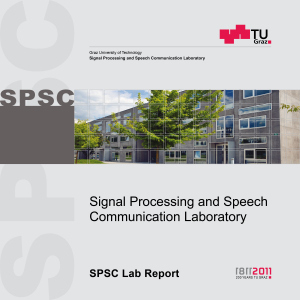 In 2000, the Signal Processing and Speech Communication Laboratory (SPSC Lab) of Graz University of Technology (TU Graz) was founded as a research and education center in nonlinear signal processing and computational intelligence, algorithm engineering, as well as circuits & systems modeling and design. It covers applications in wireless communications, speech/audio communication, and telecommunications. If you want to learn more about Signal Processing, click: "What is Signal Processing?" Homophones pose serious issues for automatic speech recognition (ASR) as they have the same pronunciation but different meanings or spellings. Homophone disambiguation is usually done within a stochastic language model or by an analysis of the homophonous word’s context. Whereas this method reaches good results in read speech, it fails in conversational, spontaneous speech, where utterances are often short, contain disfluencies and/or are realized syntactically incomplete. Phonetic studies have shown that words that are homophonous in read speech often differ in their phonetic detail in spontaneous speech. Whereas humans use phonetic detail to disambiguate homophones, this linguistic information is usually not explicitly incorporated into ASR systems.